And here goes another piece of art which I truly admire. Again, it is by Kasia Derwinska, one of my favorite artists on Saachi Art but also one of my favorite artists in general. And a beautiful work it is too. Look at it. Who doesn’t know the story of Alice in Wonderland? Which was, by the way written more than 100 years ago (1865). Yep. Well, for this is not so much about the time, we all know the clock is ticking, but that doesn’t bother me much because I don’t really believe in time. I refuse to be under the pressure “Oh, you gotta do this before you 40, then this before you 50, you gotta do that and, otherwise it will be too late … ” Nooo… that’s just not me. And I don’t think this is the message here. What really attracted me to this image is the key and the invitation. The possibility. Red pill or blue ill. 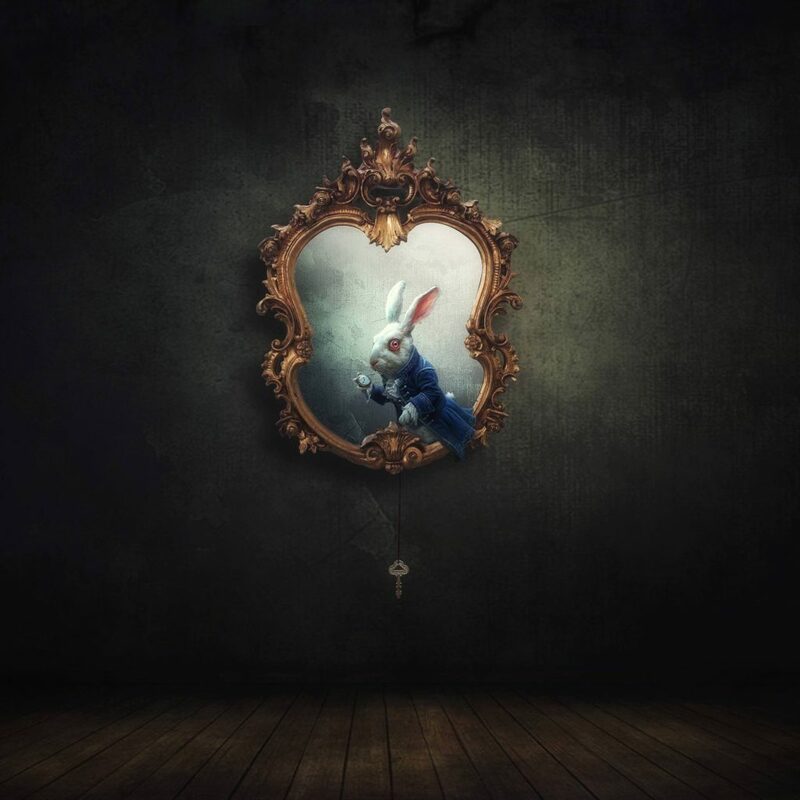 But instead of the Morpheus, this time there is this rabbit and his jacket, pocket watch in his hand and a key in another. Now, that’s intriguing. Another world. World of imagination. World that we don’t and can’t perceive as real, but the invitation seems real. And tempting. Getting away from it all. But unlike in the movie Matrix, this time you are invited into the world which has absolutely nothing to do with your current reality. A parallel universe. So? Would you come? Would you come even if there was no guarantee you’ll ever come back? Yeah, tempting, but you’re not sure, right? It all depends. On the moment. And your state of mind. I know. There are times when we’d just go, in a split second and then, there are times when we’d rather not. Whatever the case may be, I wish you a great, great day, enjoy whatever you do, enjoy the art, enjoy your imagination, be creative and dive into the creative work of other artists. Actually, you know what is the focal point in this image? It’s the key. You can blur everything else out. It is the key which just hangs out over there loosely, the question is – Will you grab it? Or will you just stare at it? Or, may, just as well move along looking for, well, whatever it is you’re looking for in your life. Key is there at all times. Anyways. Boy! Am I going to have some tough time finding another expression as talkative as this image of the rabbit with a key. Kim, thank you for buying my picture. This is the first tangible picture I ever sold. Ever. I was always selling digital downloads only and I can’t tell you… it’s an honor. So thanks.